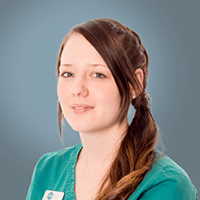 Jamielee gained her nursing degree from the Royal Veterinary College, qualifying in 2010 (with distinction). She initially worked in a small mixed animal practice before progressing to Barrow Hill Veterinary Hospital in Kent. Jamielee joined the nursing team at SCVS, in January 2011, after relocating to Dorset. She rotated through the disciplines for several months before specialising in internal medicine. Jamielee achieved the Graduate Diploma in Professional and Clinical Veterinary Nursing (with distinction) in 2014; achieving an additional award for overall highest mark. She later completed the City and Guilds certificate in Emergency and Critical Care in 2016. Jamielee is now studying towards the ESVPS NCert in Anaesthesia. Jamielee was promoted to Deputy Nursing Manager in 2016 and assists Jo and Katie with management of the nursing team whilst also being responsible for the daily running and organisation of the Internal Medicine Department, Dispensary and in-house Laboratory.